From the china to the seating, lighting, and more, it is the small nuances that create the ambiance of any dining establishment. Whether it is a boutique restaurant or a campus dining room, every project has a goal to create a unique atmosphere – and we can help. 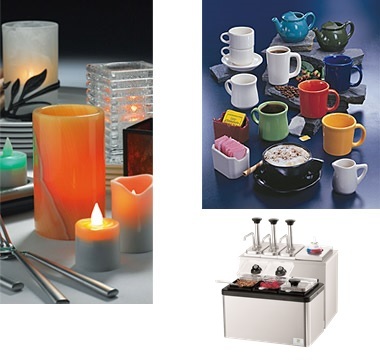 Dining Essentials’ focus is on the fine elements of the foodservice industry – concentrating on china, utensils, seating... As a brand of Squier Associates, Inc., you can be assured of the same attention to detail and dedicated customer service that sets our rep firm apart from others. To be the premier rep agency in our territory that sells and specifies furniture and supplies for the foodservice industry based upon our solid reputation and ability to deliver results. "During a time when many distributors are seeing a significant decline in the selling support provided by manufacturer representatives, the reps. of Squier Associates are a refreshing contrast. They help create sales of their lines through sales training, creative promotion, and end user team selling." "The Squier Associates team is a pleasure to work with. They are clearly among the tops in the area in product knowledge and service. Their line list is second to none and I have complete faith in them to get the job done!" "Squier Associates has represented Hollowick for more than 25 years, and all through those years they have consistently demonstrated the highest levels of performance and professionalism. They are, in a word, excellent. We sincerely consider it a privilege to be able to work with Alan Squier and his entire team." "Squier Associates is one of the most organized and professional manufacturer rep groups that I have had the pleasure of having on my team. They have fantastic relationships on all levels and the ability to not only manage everyday business but also strategically plan for the future."